The NBA playoffs continued Sunday with four more first-round series. To kick off the day, the fourth-seeded Boston Celtics used a phenomenal defensive performance in the second half to crush the visiting Indiana Pacers. During the third quarter, the Boston held Indiana to just 2-of-19 shooting from the field, and outscored the Pacers 26-8 in the frame. Things then swung over to the Western Conference for the second contest of the day between the third-seeded Portland Trail Blazers and sixth-seeded Oklahoma City Thunder. Using a 39-point opening quarter to jump ahead, the Blazers held control against the Thunder, leading them for all but 23 seconds of Game 1. In the evening slate, the East’s top-seeded Milwaukee Bucks embarrassed the eighth-seeded Detroit Pistons, beating them by a score of 121-86. The Pistons were without Blake Griffin, who continues to be out on a day-to-day basis due to a knee injury. Giannis Antetokounmpo only had to play 23 minutes in the blowout, posting 24 points and 16 rebounds in limited action. 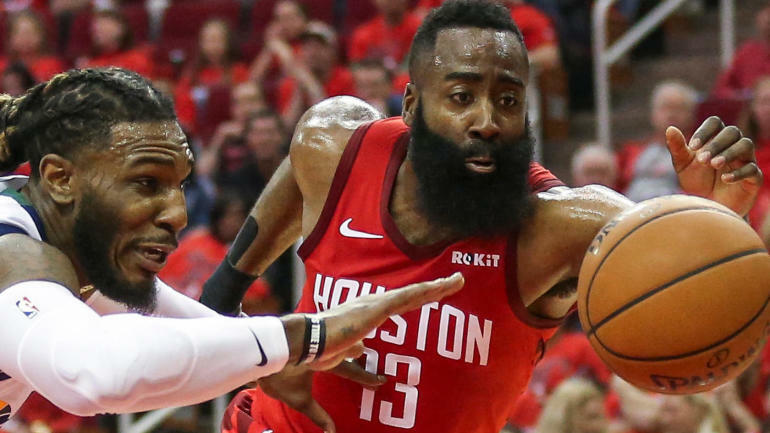 Lastly, reigning MVP James Harden and the Houston Rockets jumped out to a double-digit lead in the first quarter over the Utah Jazz, and never trailed again. Harden finished with 29 points, eight rebounds and 10 assists in the 32-point win. James Harden was at it again in Game 1 against the Jazz. Finishing with 29 points, eight rebounds and 10 assists, Harden just missed a triple-double as he led his squad to a 32-point victory. Chris Paul is still as crafty as they come, and he showed off his playmaking ability with a nice bounce pass through traffic to a cutting Kenneth Faried, who threw it down with authority. Giannis Antetokounmpo led the way with 24 points and 17 rebounds, as seven Bucks scored in double figures in Milwaukee’s 121-86 victory over Detroit in Game 1 of their first-round series. We all know the Pistons are no match for the Bucks, but this was just adding insult to injury. As the Bucks poured it on the Pistons in Game 1 of their first-round matchup, Brook Lopez made Thon Maker fly to the ground on this swat. It took a historically bad 3-point shooting performance by the Thunder (5-of-33, 15.2 percent), but the Blazers got it done as they defeated Oklahoma City, 104-99, in Game 1. Damian Lillard scored 30 points, C.J. McCollum contributed 24 points and Enes Kanter posted 20 points and 18 rebounds as Portland snapped a 10-game postseason losing streak. The Thunder have had a miserable 3-point shooting performance, but this happened right after they converted on just their fourth 3-pointer of the game. After Paul George converted on a trey to pull the Thunder within one, Damian Lillard nailed this long-range dagger on the following possession. Jerami Grant may not be a household name, but he pulls off some of the best highlights in this league. Check out this swat from Grant on the Blazers’ Maurice Harkless. If you were looking for a phantom cam highlight, you’ve come to the right place. As the Portland Trail Blazers look to hold off the Oklahoma City Thunder in Game 1, Damian Lillard just hit a nice up-and-under layup on Jerami Grant. CJ McCollum missed a number of games down the stretch run of the regular season due to injury but he appears to be feeling just fine in his 2019 postseason opener as he poured in 16 points in the first half to help Portland take a 54-48 lead into the break. Game 1 in Boston wasn’t exactly an offensive masterpiece, and neither was this shot by Terry Rozier. Still, the Celtics guard got his flailing 3-point attempt to go at the buzzer to give his team a big boost. Out on the fastbreak, Al Horford let Bojan Bogdanovic fly by, and thought he had an easy dunk. Thaddeus Young, however, had other ideas.